After the success of last years JAM on the Marsh on Kent’s glorious Romney Marsh, I thought I would get in touch to tell you about this July’s sensational line up. 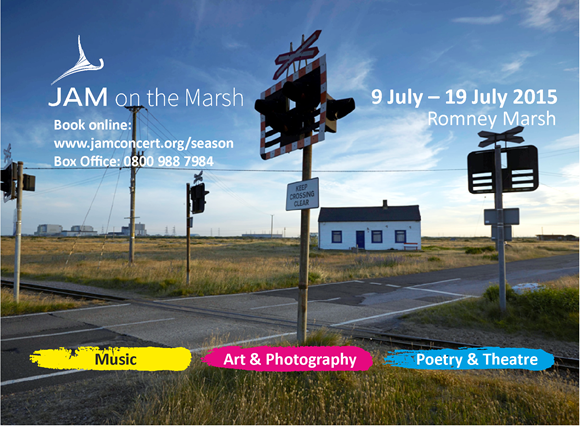 From 9th-19th July, curated by world famous composer Paul Mealor, JAM on the Marsh 2015 will feature sensational concerts, a safari opera dinner, theatre, poetry recitals, beach-combing for children, stunning photography and the rare opportunity to have your dreams turned into a piece of art. Two weeks today Sounds Baroque kicks off the festival’s music, performing Pergolessi’s achingly beautiful Stabat Mater and Bach’s Brandenburg Concerto No. 5 in Snargate. The following night at All Saints, Lydd, the world-class Chapel Choir of Selwyn College, Cambridge and Onyx Brass will perform Paul Patterson’s The Fifth Continent; a powerful work, in part sea-swirling in part so peaceful, about the Marsh. This will be joined by our Festival Commission, The Voices of Our Ancestors by internationally respected Thea Musgrave. Paul Mealor’s chart-topping hit Now Sleeps the Crimson Petal also features, with pieces by Whitacre and Lauridsen. Daniel Cook comes to Lydd a day after playing this recital at Westminster Abbey, in their prestigious Summer Organ Festival. A few days later he returns with the Mousai Singers to perform Duruflé’s spellbinding and deeply spiritual, Requiem in a concert of English and French classics; Entente Cordiale! The Festival Chamber Orchestra of Canterbury will join the festival for the first time, performing a treat of orchestral favourites from Bach, Mozart, Corelli, Walton and Albinoni, getting St Leonard’s, Hythe ready for the weekend. For info and booking for all our events please click here or call 0800 988 7984. New music, we love it. This entry was posted on 9 July, 2015 in homepage and tagged art and photography, Cambridge and Onyx Brass, Chapel Choir of Selwyn College, Daniel Cook, Duruflé, Edward Armitage, Kate Walters, Mousai Singers, music, Paul Mealor, Paul Patterson, poetry and theatre, Romney Marsh event, Sounds Baroque, The Festival Chamber Orchestra of Canterbury, Thea Musgrave.. Bookmark the permalink.